Reading and share top 499 famous quotes and sayings about Faith In God by famous authors and people. Browse top 499 famous quotes and sayings about Faith In God by most favorite authors. 1. "If we would rise into that region of light and power plainly beckoning us through the Scriptures of truth we must break the evil habit of ignoring the spiritual. We must shift our interest from the seen to the unseen. For the great unseen Reality is God. "He that cometh to God must believe that he is, and that he is a rewarder of them that diligently seek him." This is basic in the life of faith. From there we can rise to unlimited heights. "Ye believe in God," said our Lord Jesus Christ, "believe also in me." Without the first there can be no second." 2. "Faith is the gaze of a soul upon a saving God." 3. "God dies when faith in god dies but gods principle live till we live." 4. "In the light of His example we can see, in the faith of His power we too can prove, that suffering is to God's child the token of the Father's love, and the channel of His richest blessing. [. . .]Suffering is the way of the rent veil, the new and living way Jesus walked in and opened for us." 5. "The Lord's message rang out from you, not only in Macedonia and Achaia, but in every place that your faith in God has gone out. 1 Thessalonians 1:8"
6. "Your faith and hope are in god." 7. "The North American Church is at a critical juncture. The gospel of grace is being confused and compromised by silence, seduction, and outright subversion. The vitality of the faith is being jeopardized. The lying slogans of the fixers who carry religion like a sword of judgment pile up with impunity. Let ragamuffins everywhere gather as a confessing Church to cry out in protest. Revoke the licenses of religious leaders who falsify the idea of God. Sentence them to three years in solitude with the Bible as their only companion." 8. "I continue to experience my faith in God as a personal relationship between the two of us. However, having admitted my commonality with the human race, I find that my faith does not flourish in isolation. As much as I hate to admit it, my faith is enhanced and enlarged when in relationship to other less-than-perfect human beings. Even though at times other Christians can be quite annoying, I feel very fortunate to have found my way back to a spiritual community that puts up with me even when I'm a bit annoying myself." 9. "We, the called and faithful and chosen, we will drive away our griefs, and set up our banners of confidence in the name of God." 10. "Faith, in its most correct form, never removes responsibility; it removes fear of responsibility. The results are complete opposites with the greater saying, 'God's will is my delight." 11. "We can put it this way: the man who has faith is the man who is no longer looking at himself and no longer looking to himself. He no longer looks at anything he once was. He does not look at what he is now. He does not even look at what he hopes to be as the result of his own efforts. He looks entirely to the Lord Jesus Christ and His finished work, and rests on that alone. He has ceased to say, "Ah yes, I used to commit terrible sins but I have done this and that." He stops saying that. If he goes on saying that, he has not got faith. Faith speaks in an entirely different manner and makes a man say, "Yes I have sinned grievously, I have lived a life of sin, yet I know that I am a child of God because I am not resting on any righteousness of my own; my righteousness is in Jesus Christ and God has put that to my account." 13. "For Christians . . . an unreflective faith is not possible if we take seriously the injunction to love God with the mind as well as the heart and soul." 14. "It stank pretty bad, of course: manure was caked all over the wagon. But we were free. Right then I was elated with a sense of how faithful God is to his promises; I was free, and I was smiling joyfully on a manure wagon. As we ambled along, I laughed to myself when I thought of God's sense of humor in delivering us that way. Even today, the smell of manure reminds me of freedom." 15. "We hope in Jesus the Christ, in the goodness of God, in the manifestations of the Holy Spirit, in the knowledge that prayers are heard and answered. Because God has been faithful and kept His promises in the past, we can hope with confidence that God will keep His promises to us in the present and in the future. In times of distress, we can hold tightly to the hope that things will ‘work together for [our] good' as we follow the counsel of God's prophets. This type of hope in God, His goodness, and His power refreshes us with courage during difficult challenges and gives strength to those who feel threatened by enclosing walls of fear, doubt, and despair." 16. "I come now to tell you for what I am brought here to die, and to give you an account of my faith, which I shall do as in the sight of the living God before whom I am shortly to stand." 17. "Europe is equal to its historical task. Against the anti-spiritual, anti-heroic 'ideals' of America-Jewry, Europe pits its metaphysical ideas, its faith in its Destiny, its ethical principles, its heroism. Fearlessly, Europe falls in for battle, knowing it is armed with the mightiest weapon ever forged by History: the superpersonal Destiny of the European organism. Our European Mission is to create the Culture-State-Nation-Imperium of the West, and thereby we shall perform such deeds, accomplish such works, and so transform our world that our distant posterity, when they behold the remains of our buildings and ramparts, will tell their grandchildren that on the soil of Europe once dwelt a tribe of gods." 18. "You can make a successful run for political office in this country without an especially thick résumé, any exceptional talent for expressing yourself, a noteworthy education or, for that matter, a basic grasp of science.But you better have religion. You better be ready to profess your faith in and fealty to God — the Judeo-Christian one, of course. And you better be convincing. A dust-up last week in the 2014 race for a United States Senate seat from Arkansas provided a sad reminder of this, showing once again that our ballyhooed separation of church and state is less canyon than itty-bitty crack." 19. "Catholic missionaries labored earnestly to convert indians. They fervently believed that God expected them to save the Indians' souls by convincing them to abandon their old sinful beliefs and to embrace the one true Christian faith. But after baptizing tens of thousands of Indians, the missionaries learned that many Indians continued to worship their own gods. Most priests came to believe that the Indians were lesser beings inherently incapable of fully understanding Christianity." 20. "Keep your faith. Look for the good in your situation. Do something kind for someone. Seek Christ devoid of wrapping and tinsel. You will find that despite external circumstances, Christmas—like the kingdom of God—is ‘within you' (Luke 17:21)." 21. "Faith has not increased in the world, nor has righteousness, nor obedience to God. What the world needs today is to draw nearer to the Lord. We need more humble, abiding faith in our Redeemer, more love in our hearts for our Eternal Father and for our fellow men. We live in a wonderful age. The great inventions of our day exceed what was known in all former ages. Unfortunately these inventions have failed to bring men nearer to God"
22. "Jeb regarded me with n o expression. "Do you believe in God, Allison? ""No," I said immediately. "Is this the part where you tell me I'm going to hell? ""This is hell," Jebbadiah said, gesturing to the town around us. "This is our punishment, our Tribulation. God has abandoned this world. The faithful have already gone on to their reward, and he has left the rest of us here, at the mercy of the demons and the devils. The sins of our fathers have passed to their children, and their children's children, and it will continue to be so until this world is completely destroyed. So it doesn't matter if you believe in God or not, because He is not here." 23. "For you, hunting the Twelve isn't an answer. It's a question. Does anybody out there care? Are we worth saving? What would God want from me, if there is a God? The greatest faith is the willingness to ask in the first place, all evidence to the contrary. Faith not just in God, but in all of us." 24. "And here she was. Lying on the floor of a dusty, empty, locked room thinking how grateful she felt.She smiled, though it hurt tremendously to do so, thinking how blessed she had been to have spent twelve years with the most precious gifts from God. She felt honored that they called her mother. She knew she had done the best she could teaching them about life and love, faith and family. Margo lay slowly dying from the wounds inflicted by a monster, but she was at peace. Because though the devil meant it for evil, God turned it to good." 25. "Having faith in God did not mean sitting back and doing nothing. It meant believing you would find success if you did your best honestly and energetically." 26. "The faith that joins you to Christ and makes you right with God is a faith that works itself out in love (Gal. 5:6). On the last day, God will not acquit us because our good works were good enough, but he will look for evidence that our good confession was not phony. It's in this sense that we must be holy." 28. "The heavenly blessing is to be delivered from the law, sin and death; to be justified and quickened to life: to have peace with God; to have a faithful heart, a joyful conscience, a spiritual consolation; to have the knowledge of Jesus Christ; to have the gift of prophecy, and the revelation of the Scriptures; to have the gift of the Holy Ghost, and to rejoice in God." 29. 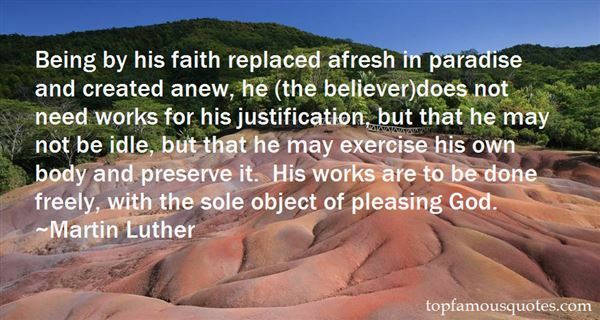 "Being by his faith replaced afresh in paradise and created anew, he (the believer)does not need works for his justification, but that he may not be idle, but that he may exercise his own body and preserve it. His works are to be done freely, with the sole object of pleasing God." 30. "It is easy to be religious when religion is in fashion; but it is an evidence of strong faith and resolution to swim against a stream to heaven, and to appear for God when no one else appears for Him." 31. "The key for me was to have faith and trust in God to transform me. This was scary because the foundation that once kept me safe and secure was being taken from me!" 32. "I still have a belief and a faith that some great things are still going to happen in my career. If I didn't believe that, it makes no sense for me to be out there, and on top of that, I know this is a period of time that God wants me to persevere through." 33. "The gospel of submission, commitment, decision, and victorious living is not good news about what God has achieved but a demand to save ourselves with God's help. Besides the fact that Scripture never refers to the gospel as having a personal relationship with Jesus nor defines faith as a decision to ask Jesus to come into our heart, this concept of salvation fails to realize that everyone has a personal relationship with God already: either as a condemned criminal standing before a righteous judge or as a justified coheir with Christ and adopted child of the Father." 34. "You...you lost your faith? ""No...just my convictions. I still very much believe in God- just not a god who condones human tithing." Lev begins to feel himself choking up with an unexpected flood of feeling, all the emotions that had been building up throughout their talk- throughout the weeks- arriving all at once like a sonic boom. "I never knew there was a choice." 35. 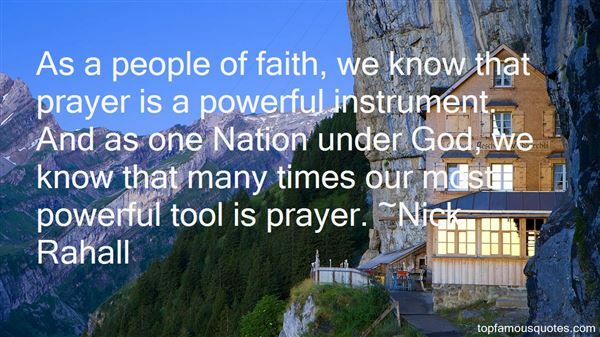 "As a people of faith, we know that prayer is a powerful instrument. And as one Nation under God, we know that many times our most powerful tool is prayer." 36. "If Man retained faith in God, he might also retain faith in Man." 37. "Faith consists in being vitally concerned with that ultimate reality to which I give the symbolical name of God. Whoever reflects earnestly on the meaning of life is on the verge of an act of faith." 38. "In Mere Christianity, C. S. Lewis argues that human beings cannot be truly good or moral without faith in God and without submis- sion to the will of Christ. Unfortunately, Lewis does not provide any actual data for his assertions. They are nothing more than the mild musings of a wealthy British man, pondering the state of humanity's soul between his sips of tea. Had Lewis actually famil- iarized himself with real human beings of the secular sort, per- haps sat and talked with them, he would have had to reconsider this notion. As so many apostates explained to me, morality is most certainly possible beyond the confines of faith. Can people be good without God? Can a moral orientation be sustained and developed outside of a religious context? The answer to both of these questions is a resounding yes." 39. "We are told today that in the boldness of faith we are to "name it and claim it." I suppose I should be more measured in my response to this trend, but I can't think of anything more foreign to the teaching of Christ. We come to the presence of God in boldness, but never in arrogance. Yes, we can name and claim those things God has clearly promised in Scripture. For instance, we can claim the certainty of forgiveness if we confess our sins before Him, because He promises that. But when it comes to getting a raise, purchasing a home, or finding healing from a disease, God hasn't made those kind of specific promises anywhere in Scripture, so we are not free to name and claim those things.As"
40. "The Pledge of Allegiance reflects the truth that faith in God has played a significant role in America since the days of the founding of our country." 41. "Faith is the first step to understanding. Either it's the Word of an infallible God, the fallible words of men, or faith in what you personally believe. You've got to have faith in something. Believe me." 42. 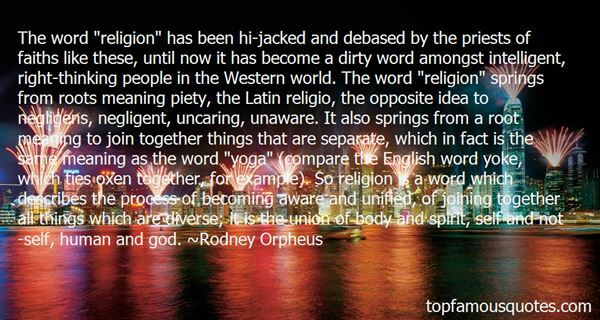 "The word "religion" has been hi-jacked and debased by the priests of faiths like these, until now it has become a dirty word amongst intelligent, right-thinking people in the Western world. The word "religion" springs from roots meaning piety, the Latin religio, the opposite idea to negligens, negligent, uncaring, unaware. It also springs from a root meaning to join together things that are separate, which in fact is the same meaning as the word "yoga" (compare the English word yoke, which ties oxen together, for example). So religion is a word which describes the process of becoming aware and unified, of joining together all things which are diverse; it is the union of body and spirit, self and not-self, human and god." 43. "While contemporary non-Evangelicals have virtually reduced faith to 'courageous ignorance,' Evangelicals have hardly been faithful in defending God's objective communication of truth." 44. "How can you have such faith in me?" he asked hoarsely. "How can you believe in me when I've given you no reason? ""You've given me plenty of reasons, but there's only one that matters. I love you, Oliver. I can't help myself. That is my reason. "He began to shake, his eyes glistening with unshed tears. "I love you," she repeated as she kissed his cheek. "I love you." She kissed the other cheek, now damp, though she wasn't sure whether from her tears or his. "I love you so much." She brushed his lips with hers.He held her back to search her face. "God help you if that is a lie," he said in an aching voice. "Because those words have sealed your fate. I'll never let you go, now." 45. "The sight of her made him understand why he'd lost his faith in God." 46. "It is now my intention to draw out from the story of Abraham the dialecticalconsequences inherent in it, expressing them in the form ofproblemata, in order to seewhat a tremendous paradox faith is, a paradox which is capable of transforming amurder into a holy act well-pleasing to God, a paradox which gives Isaac back toAbraham, which no thought can master, because faith begins precisely there wherethinking leaves off." 47. "God Himself is the rule and mode of virtue. Our faith is measured by divine truth, our hope by the greatness of His power and faithful affection, our charity by His goodness. His truth, power and goodness outreach any measure of reason. We can certainly never believe, trust or love God more than, or even as much as, we should. Extravagance is impossible. Here is no virtuous moderation, no measurable mean; the more extreme our activity, the better we are." 48. "A demon, in a way, is a test of your faith. Because if you're doing God's work, there's no reason for any demon to do anything to you." 49. "All my life I'd been a believing Christian. ... But that instant in the ER--the instant Annette [his wife] died--I seemed to feel my religious faith die, too.As I thought more about it in the bleak days and weeks that followed, I decided the Bible had gotten it exactly backward. Maybe God hadn't created us in His image; maybe we'd created god in our image." 50. "But it was hard, oh, it was hard. Faith in God is an opening up, a letting go, a deep trust, a free act of love--but sometimes it was so hard to love. Sometimes my heart was sinking so fast with anger, desolation, and weariness, I was afraid it would sink to the very bottom of the Pacific and I would not be able to lift it back up." It's nice not to be too boring."